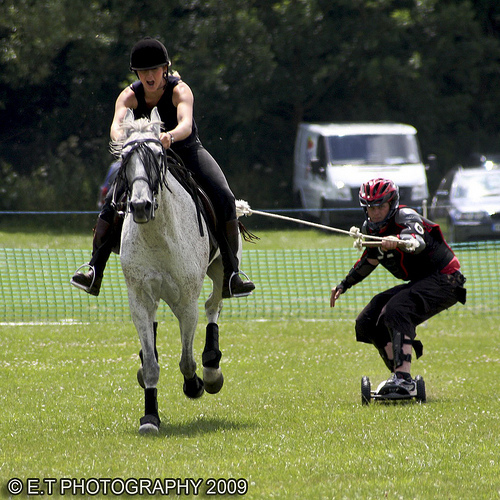 Horse boarding riders wear protective pressure suits and communicate with the horse rider to adapt speed and acceleration, but people thinking to try out the sport have to be prepared for some serious bumps. Falling off the board at high speeds has been compared to jumping out of a car at 30 mph, which I suspect is pretty serious. But Daniel says ”there’s a raw surge of natural power you wouldn’t get from any other sport, and the acceleration is explosive” so, what’s a few broken bones? As the newest equestrian sport in a while, horse boarding is gaining a lot of popularity, really fast, so its inventor saw an opportunity to organize the first championship, in the coming summer. 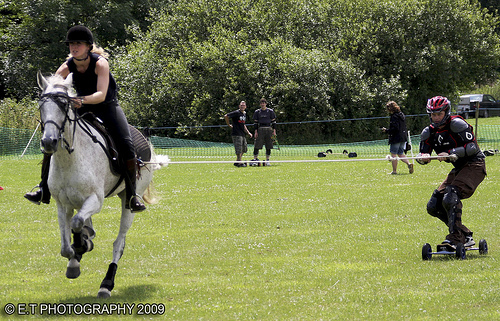 Competing teams, made up of a board rider, a horse and a horse rider, will race on a 100 meter course, with the one that crosses the finish line first being declared winner. So if you like horse riding and skateboarding, you’ll want to keep your eyes on this one.